Located at the foot of of the mighty Stelvio PASS and within the Stelvio National Park, this is a superb area to explore by bike. The Gavia & Mortirolo passes are also within easy reach. The hotel has secure bike storage and hire, dinner included, daily packed lunches, workshop and Spa facilities. On the other hand, those who prefer mountain biking will not be disappointed by the large selection of trails for downhill, cross country, and freeride. Or for those who prefer to ride with peace of mind, there are plenty of bike paths, and for children, there is the Bike and Skill Centre. There is also E-bike rental and bike sharing so it’s possible to use a city bike free of charge. Bormio is a junction point of major roads. In particular, the Stelvio Pass state road that connects the lower Valtellina to Trentino Alto Adige. Crossing the Stelvio Pass, which at 9,048 feet, is the highest paved pass in Italy and the second highest in Europe. 25% booking deposit required in order to reserve. Non-cycling partners are welcome - please enquire and we can provide a bespoke package. It is located in the Raetic sector, on the border with the Swiss Canton of Grisons, about 200 Km from Milan city. The territory, included in the Alta (High) Valtellina, is located at the foot of Stelvio Pass and within the Stelvio National Park, the largest protected area of Italy and one of the largest in Europe. Bormio is a junction point of major roads. In particular, the Stelvio Pass state road that connects the lower Valtellina to Trentino Alto Adige. Crossing the Stelvio Pass which at 9,048 feet (2758 meters) is the highest paved pass in Italy and the second highest in Europe. The hotel is surrounded by nature and just a short walk from the centre of Bormio. All 36 bedrooms are ensuite, with TV and telephone. Spacious and comfortable, they enjoy a magnificent view. Private parking, garage, TV lounge, basement disco-bar, safety deposit for valuable belonging, swimming pool, sauna, Turkish bath, gymnasium, games room, ski and ski-boot storage room, tennis court, all these facilities are available for guests’ comfort. Their courtesy and experience in running the hotel is the best guarantee for a truly relaxing cycling holiday. You can rent your favourite bicycle easily: racing bikes, MTBs and electric bikes. You will only be spoiled for choice, so do not miss this opportunity. There are available for our guests some MTB, free to use for easy outings. For upper range bikes our affiliate stores “Mapo” and “Ski & Bike” will satisfy your needs. Are you not trained? You do not want to make too much effort? No problem! With our e-bikes, you can easily take away a lot of satisfaction. 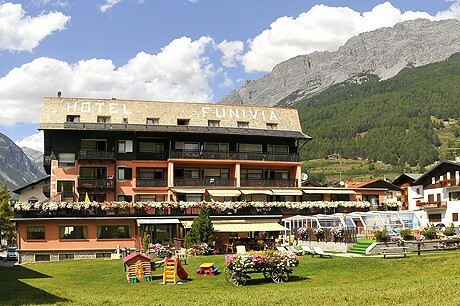 Full balance is required 10 weeks before the date of your trip to the Funivia Bike Hotel, Bormio.